It’s hard to say whether memories are fading faster these days – because who can honestly remember how things were previously? 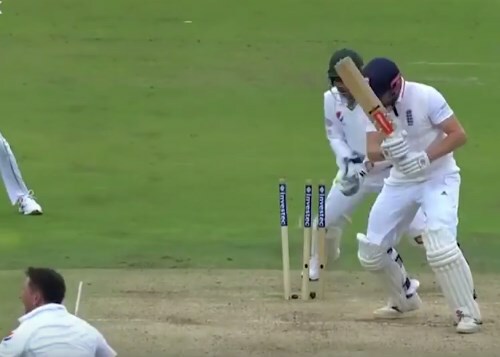 This was nevertheless a thought that has crossed our mind a few times of late – generally when some commentator or other has claimed that England have ‘worked Yasir out’ or something along those lines. We’re pretty sure England themselves never felt like that about Pakistan’s leg-spinner (or why would they have elected to bat first in this match?) Commentators though, they’re a different breed. They don’t need to accurately gauge the dangers knowing they’ll have to confront the player in question again some time soon. They can content themselves with saying whatever they’re thinking at that exact moment and if the statement seems to hold up when measured against what’s happened in the last 10 days, then it can be presented as The Truth. The thinking was that Yasir took England by surprise at Lord’s. Apparently you can deliver 10 surprises before a team will react. After that, England realised that he didn’t spin it all that much and DOMINATED HIM WITH EASE. But now that particular piece of fiction needs a rewrite. There is never one solitary solution that turns failure to success when it comes to countering a good bowler. Different batsmen will have different issues and no spin bowler will be successful in internationals without being able to pose at least a decent handful of questions. Yasir had less success at Old Trafford and Edgbaston, but a guy who takes 10 wickets in a Test match ususally has something about him that won’t fade away inside a fortnight. Sure enough, bowling at the Oval with runs in the bank, he dismissed half of England’s batting line-up. Maybe with another match and another five-for, everyone would be calling him flawless. Indeed, the 5th match decider for this series is now a mouthwatering prospect. When does it start and where is it being held? It’s spread across six days and 12 innings and will be held at multiple grounds. I believe tradition (which I know KC is a stickler for) dictates that we now say that all of the England team is worthless instead. Especially Moeen Ali. Indeed, and we should never play tests in London. Is this Pakistan side the best in the world? They are ranked behind India and Australia, but both those sides typically get marmalised against good sides away from home, including their last trips to England where Pakistan have held their own. Both India and Australia have very good home records, but Pakistan aren’t allowed to play at home, and they haven’t yet been beaten in the UAE, where they do their fair share of marmalising touring teams. They’re probably the most admirable side for many of the reasons you give, but it’s hard to say because of their odd schedule. They haven’t toured Australia since 2009, they haven’t toured New Zealand since 2010, they haven’t played the West Indies at all since 2011 and the last India series was 2008. Also, while they are pretty much unbeatable in the UAE, they do nevertheless draw there a lot. What’s the reason for all of those anomalies? Cricket is a disorganised non-meritocratic mess and no-one invites them.